There is a HUGE hole in my heart tonight. 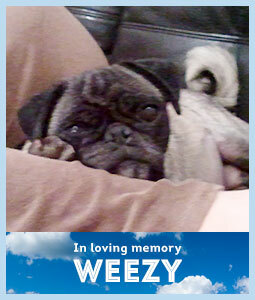 Had to let our Weezy go over the rainbow bridge this afternoon. She has taught us a lot in the 3 short years that we had her. We got her from Compassionate Pug Rescue as a 9-year old. 2mo after we got her, I noticed a growth on her belly that ended up being an aggressive type of cancer. We did 2 invasive surgeries to remove it. She was a very healthy and happy puggie for over 2 1/2yrs. Thursday she got sick and the vet found a large growth by her spleen pushing on her organs. She went down hill before we could do an ultrasound on Mon. I am extremely grateful for the unconditional love and affection that she gave to us. Words CANNOT express my love for Weezy. We will always adopt senior pugs from Compassionate Pug Rescue! There is nothing like the love of a senior rescue.